When an accident miraculously gives a boy an incredibly powerful pitching arm, he becomes a major league pitcher for the Chicago Cubs. 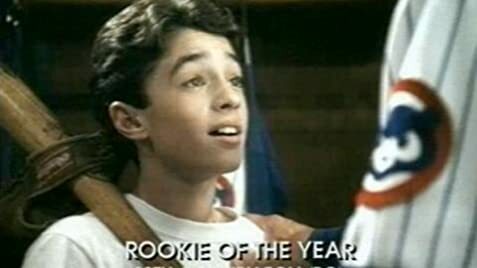 For some reason, I get a kick out of movies like "Rookie of the Year." I guess the fact that so many young boys, myself included, fantasize about playing professional sports contributes to the popularity of this genre. I think Daniel Stern did a good job directing this movie because he doesn't ever let it become too kiddy and childish. Sure there are a lot of funny moments, but they can be funny to adults as well as children. The setting of this movie cannot be beat: Wrigley Field. It doesn't get any better than that. "Rookie of the Year" is a fun movie to watch with the family. Gary Busey's mustache seen in the movie is fake. Cliff Murdoch - Announcer: Opening Day at Wrigley, and oh what a sight! The diamond, the decorations, and the dread of yet another losing season. In the final scene of the movie, Henry is shown once again playing outfield for his little league team. Though he no longer had the ability to throw 100 mph fastballs, with a season of major league pitching training and experience, it seems really strange that his coach would have him as an outfielder rather than a pitcher. Added to this, in the final major league game after falling on his arm again, Henry throws an effective change up, indicating that, even without his freak arm strength, he could still pitch at 75-80 mph. This would be extremely fast by little league standards. The actual major leaguers that strike out in the film (from 58:25 to 58:37) are listed under "Three Big Whiffers"